In 2013, Drs. James E. Rothman, Randy W. Schekman, and Thomas C. Südhof shared the Nobel Prize in Physiology or Medicine for their discoveries of molecular machineries for vesicle trafficking, a major transport system in cells for maintaining cellular processes. Vesicle traffic acts as a kind of "home-delivery service" in cells. Vesicles package and deliver materials such as proteins and hormones from one cell organelle to another. The vesicle releases its contents by fusing with the target organelle's membrane. One example of vesicle traffic is in neuronal communications, where neurotransmitters are released from a neuron. Some of the key proteins for vesicle traffic discovered by the Nobel Prize winners were N-ethylmaleimide-sensitive factor (NSF), alpha-soluble NSF attachment protein (α-SNAP), and soluble SNAP receptors (SNAREs). 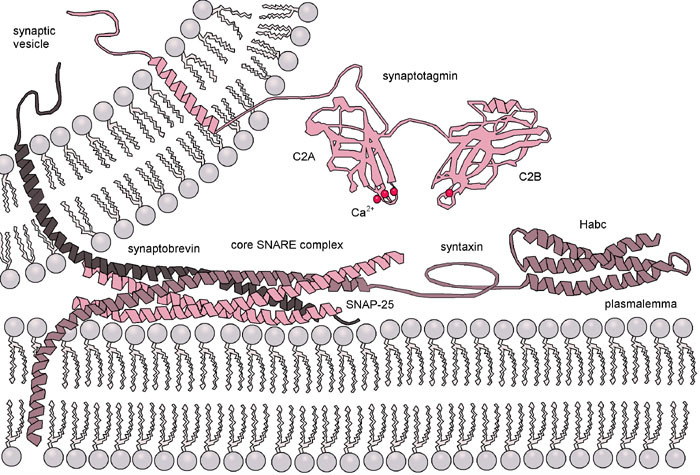 SNARE proteins are known as the minimal machinery for membrane fusion. To induce membrane fusion, the proteins combine to form a SNARE complex in a four-helix bundle, and NSF and α-SNAP disassemble the SNARE complex for reuse. In particular, NSF can bind an energy source molecule, ATP, and the ATP-bound NSF develops internal tension via cleavage of ATP. This process is used to exert great force on SNARE complexes, eventually pulling them apart. However, although about 30 years have passed since the Nobel Prize winners' actual discovery, how NSF/α-SNAP disassemble the SNARE complex has remained a mystery to scientists due to a lack the appropriate investigative methodology. Now, in article published in the March 27, 2015 issue of Science, a research team, led by Dr. Tae-Young Yoon of the Department of Physics at the Korea Advanced Institute of Science and Technology (KAIST) and Dr. Reinhard Jahn of the Department of Neurobiology of the Max-Planck-Institute for Biophysical Chemistry, reports that NSF/α-SNAP disassemble a single SNARE complex using various single-molecule biophysical methods that allow them to monitor and manipulate individual protein complexes. The Science article is titled “Spring-Loaded Unraveling of a Single SNARE Complex by NSF in One Round of ATP Turnover." "We have learned that NSF releases energy in a burst within 20 milliseconds to "tear" the SNARE complex apart in a one-step global unfolding reaction, which is immediately followed by the release of SNARE proteins," said Dr. Yoon. Dr. Yoon added, "From our research, we found that NSF requires hydrolysis of ATPs that were already bound before it attached to the SNAREs--which means that only one round of an ATP turnover is sufficient for SNARE complex disassembly. Moreover, this is possible because NSF pulls a SNARE complex apart by building up the energy from individual ATPs and releasing it at once, yielding a "spring-loaded" mechanism."